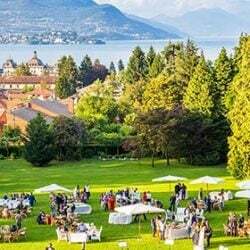 There is a special corner close to Stresa the pearl of the Lake, a wonderful luxury hotel just on the lake shore with gorgeous gardens and wonderful scenarios for a magic wedding. 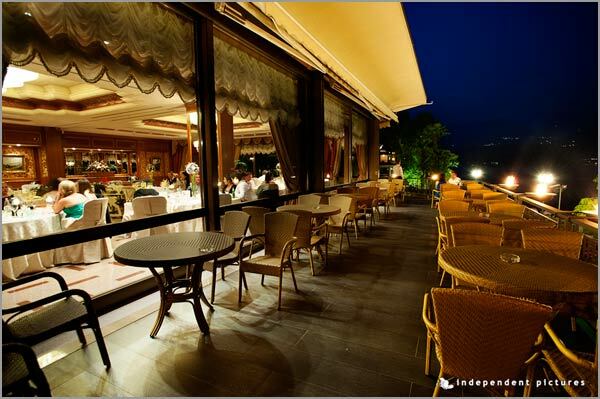 And this is the place Darren and Leanne loved when they visit Lake Maggiore one year ago when they came over to find the perfect venue on this spot of Italy: the Grand Hotel Dino in Baveno. How could I describe better a place like this? 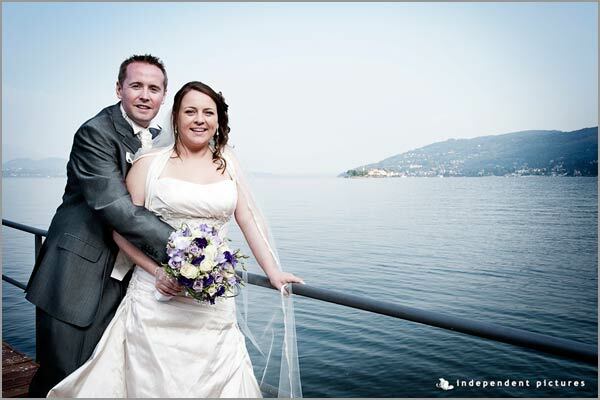 Leanne and Darren come from Ireland and the choose Lake Maggiore for their destination wedding. 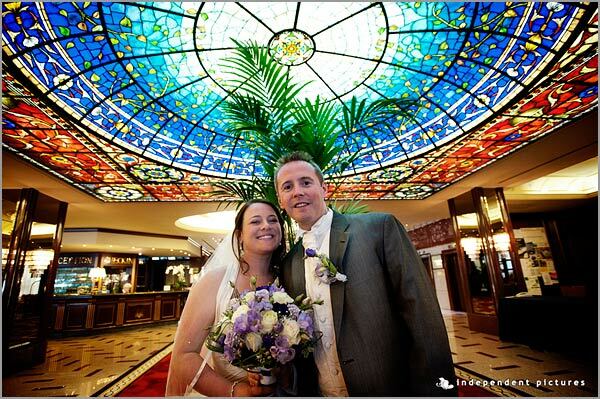 We explored several venues but as soon as they reached Hotel Dino they simply fell in love with the venue and pleasant atmosphere you breath inside. They really wanted a symbolic blessing in the grounds of the hotel. Their day was blessed with a wonderful sun and mild temperature and their dreams came true. 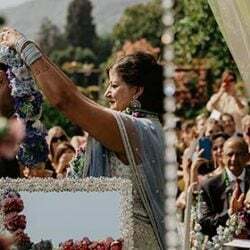 The blessing was set in the smaller and more private garden of the hotel. 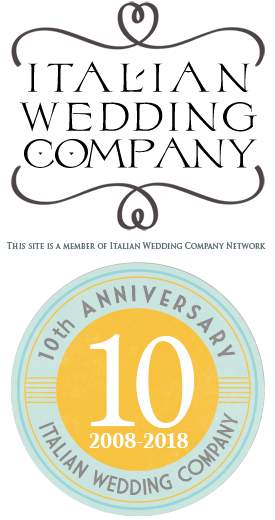 Ceremony was beautifully accompanied by the music of Koinè String Quartet. 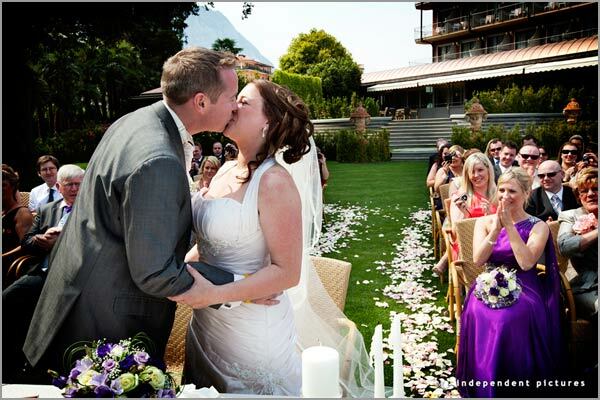 They created the perfect atmosphere for this romantic event. A wonderful soundtrack that everybody will remember for a long time! 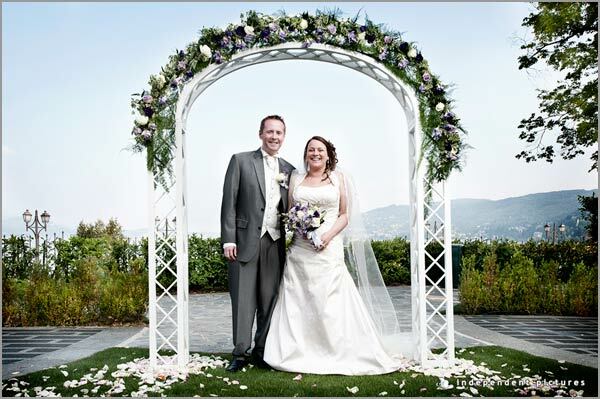 Scenographic arrival of the bride on a natural aisle to reach a wonderful arch of flowers created by La Piccola Selva that matched perfectly Leanne’s theme based on white, purple and lilac. 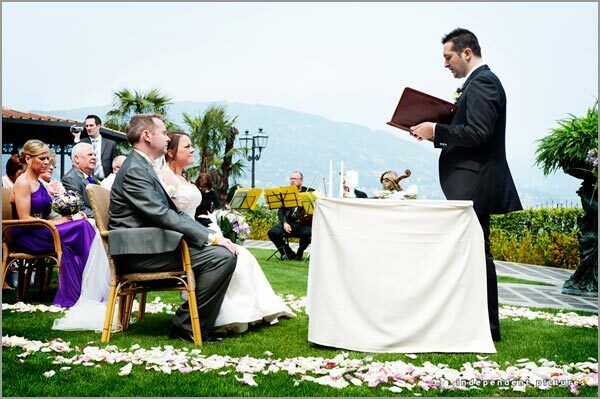 Have a look to the romantic setting La Piccola Selva and us created for Leanne and Darren’s wedding. 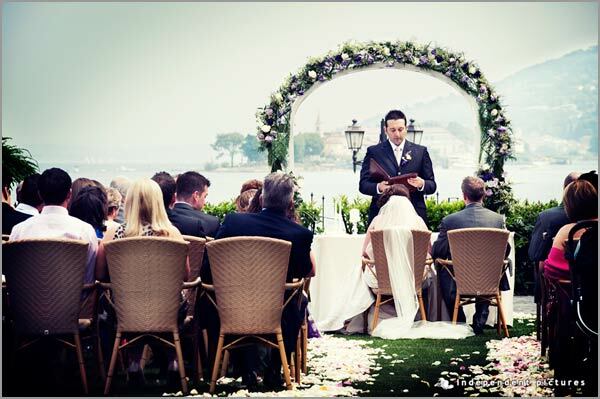 A romantic arch, petals on the aisle and a wonderful view on the lake and Pescatori Island! And let’s not forget about Leanne and bridesmaid’s bouquets and buttonholes. 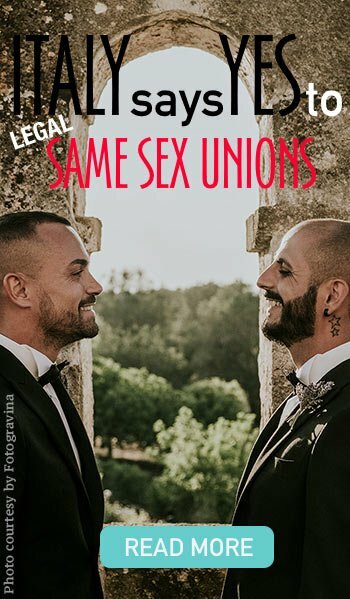 Right after the ceremony an amazing aperitif was served directly in the garden. 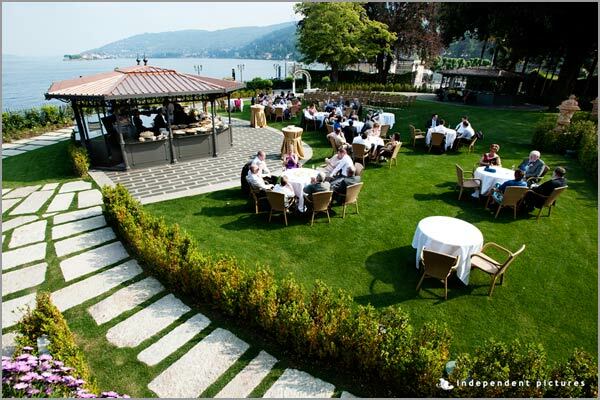 Hotel Dino and the amazing staff presented a delicious and scenic aperitif in the garden. 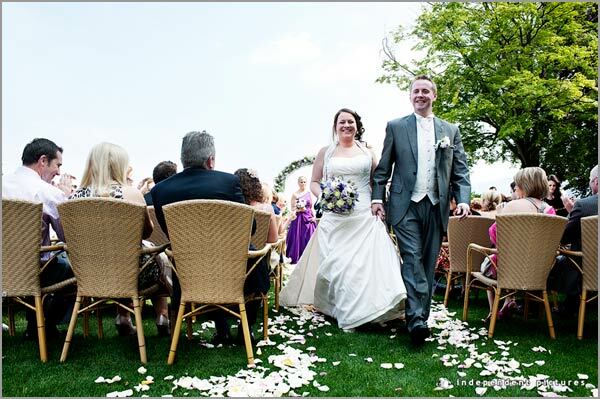 All guests enjoyed sun, prosecco drinks and lovely canape and lovely music in the garden while Leanne and Darren took some time to take great wedding pictures. An early dinner was served in the lovely room of the restaurant. For the centerpieces Monika and Paola by La Piccola Selva created lovely round shaped compositions in tall glass vases with the same flowers Leanne had on her bouquet. 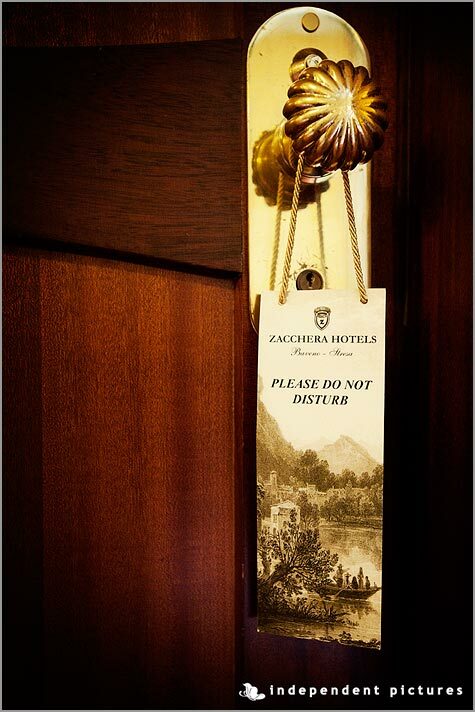 An elegant choice that matched perfectly the style of Hotel Dino. 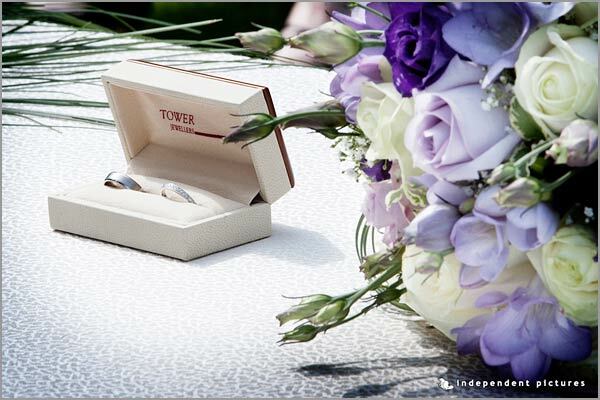 If you would like to have a look to all the images of the table arrangements follow this link. The wide reception room faces the lake. 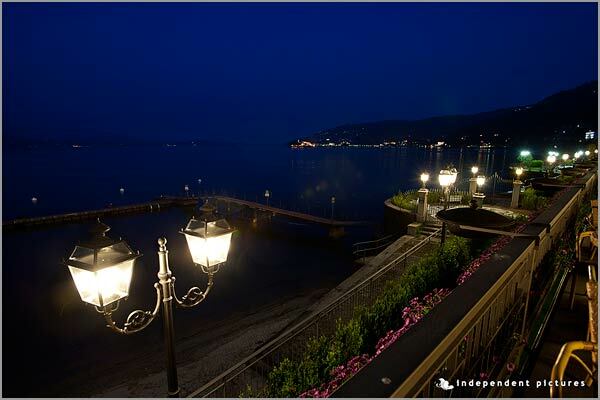 A wonderful dinner overlooking the lake, who could ask for anything more? 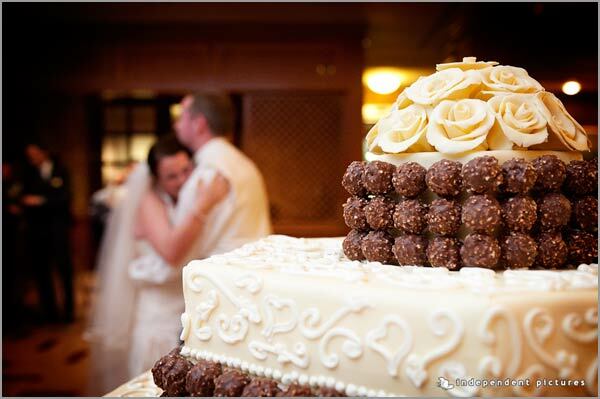 The dinner ended with a stunning wedding cake all decorated with Ferrero Rocher, Darren’s favorites! 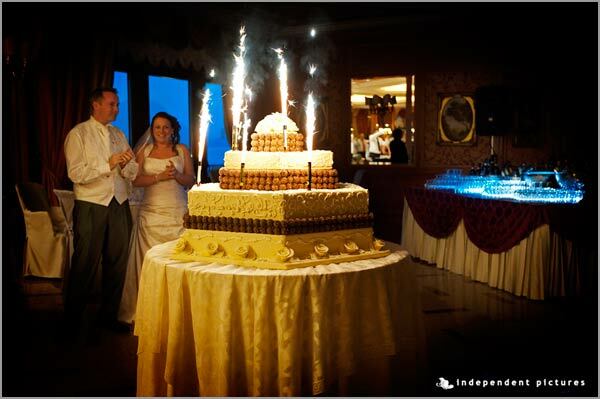 What a surprise with sparklers and Dean Martin’s That’s Amore music in the back ground! 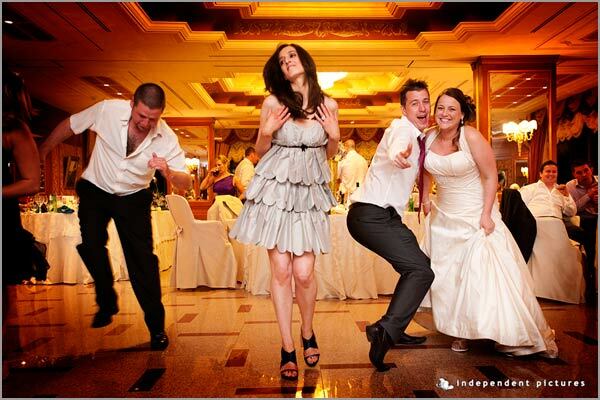 And after then let the real party go on… live music and open bar with a great band and a dj set with crazy dances until 2am. 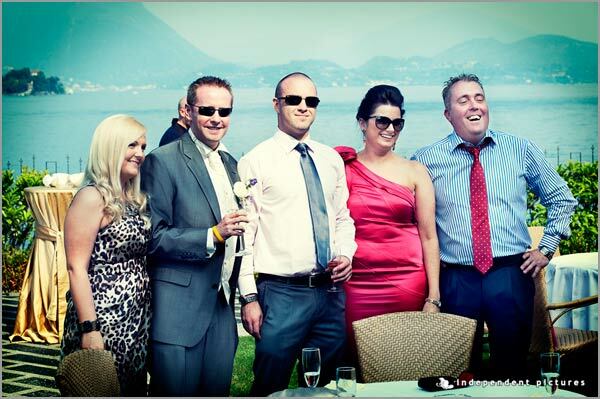 A great group a great fun on Lake Maggiore… Romanticism and fun the perfect mix for a perfect couple! 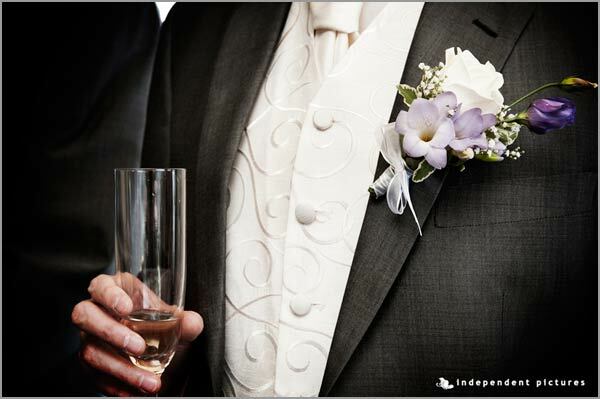 A special thank to INDEPENDENT PICTURES photographers for their great shots and for their professionalism! 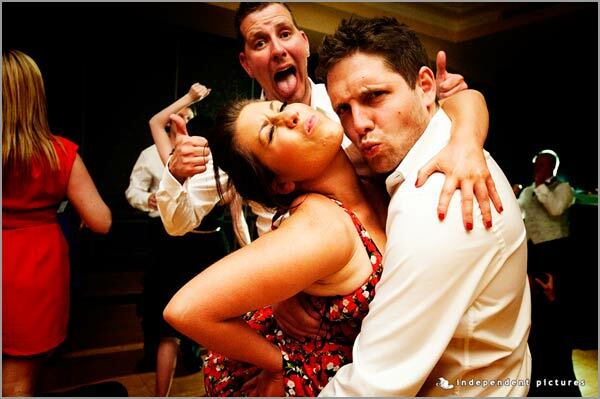 To see more details, don’t miss Darren and Leanne wedding day’s PHOTO GALLERY on our web site. 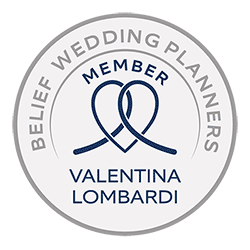 Valentina Lombardi is the Italian Lakes Wedding coordinator for Lake Orta and Lake Maggiore area. 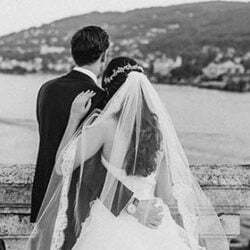 She follows Italian and foreign bridegrooms who wish to celebrate their wedding in Piemonte and Italian Lakes area. 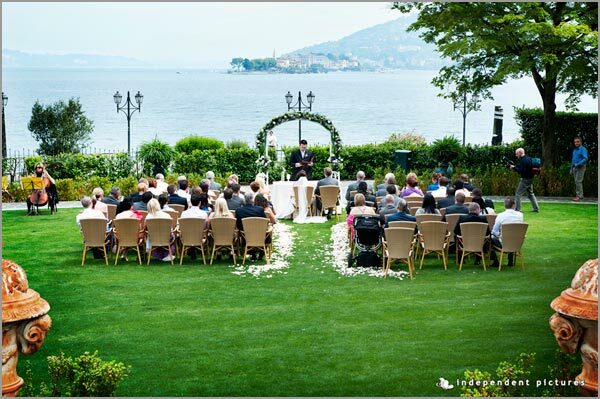 For any information about wedding on Lake Maggiore please CONTACT US.